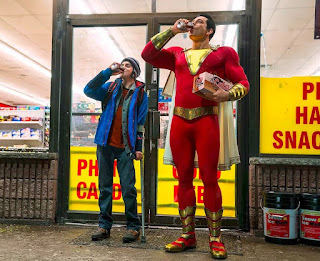 Before I get started, I just want to take a minute and acknowledge how surreal it is that you can go to the movie theater this weekend and watch both Captain Marvel and Shazam. Billy Batson and Carol Danvers are two characters I never thought we'd see on the big screen - Batson because he's silly and Danvers because I'd have sworn the one line Marvel would never cross would be putting out a movie with their company name embedded in the title - but here we are. And both of them are good. Really good, in really different ways. But not for different reasons: both Shazam! and Captain Marvel were made with respect and love for the characters being adapted, and it comes through in the finished products.